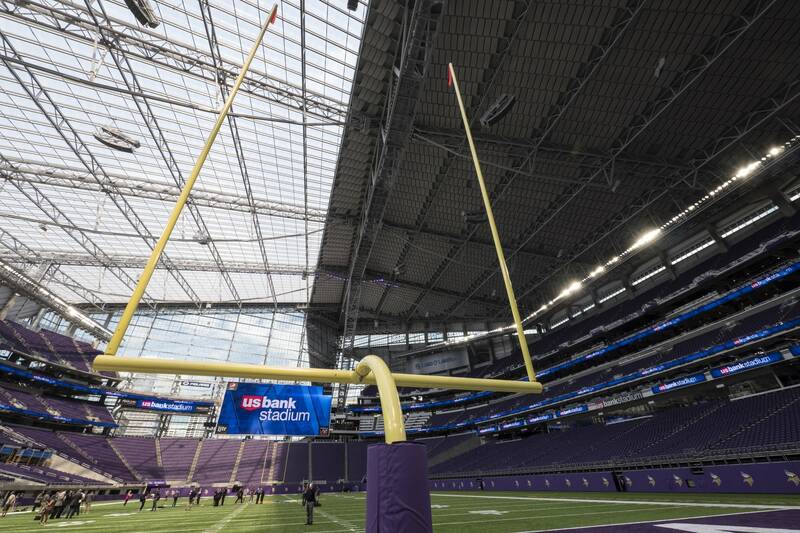 After more than a decade of debate, 969 days of construction work and more than $1 billion, U.S. Bank Stadium, Minnesota's biggest-ever public works project, opened Friday in downtown Minneapolis. Hundreds of people gathered for the event and a luncheon on the playing field, covered over with the hard plastic deck that will allow the stadium to host concerts, shows and sporting events including next year ESPN's X Games. "This is a tremendous day for Minnesota," said Gov. Mark Dayton as he spoke at the official ribbon cutting ceremony. "After years of discussion, disagreeing and agreeing ... here we are, on time and on budget. This was always about two priorities, first keeping the Vikings the Minnesota for generations to come, and second, jobs, jobs, jobs." Vikings owner Zygi Wilf and other investors put more than $600 million into the $1.122 billion project. Taxpayers from Minneapolis paid another $150 million, and the state another $348 million, financed in part by new electronic pulltabs. The deal was cut in 2012 at the Capitol after two years of legislative haggling. The stadium's already attracting concerts and big-time events beyond football. It's also helped spark a wave of redevelopment in the Downtown East neighborhood, rechristened East Town to acknowledge the renewal anchored by the new stadium. "Beyond these doors lies another $1 billion in private development ... four hotels, five office towers and a plethora of other mixed use projects," said Michele Kelm-Helgen, chair of the Minnesota Sports Facilities Authority. Her agency will host a weekend open house, opening the stadium to the general public to get a first look at the new facility. 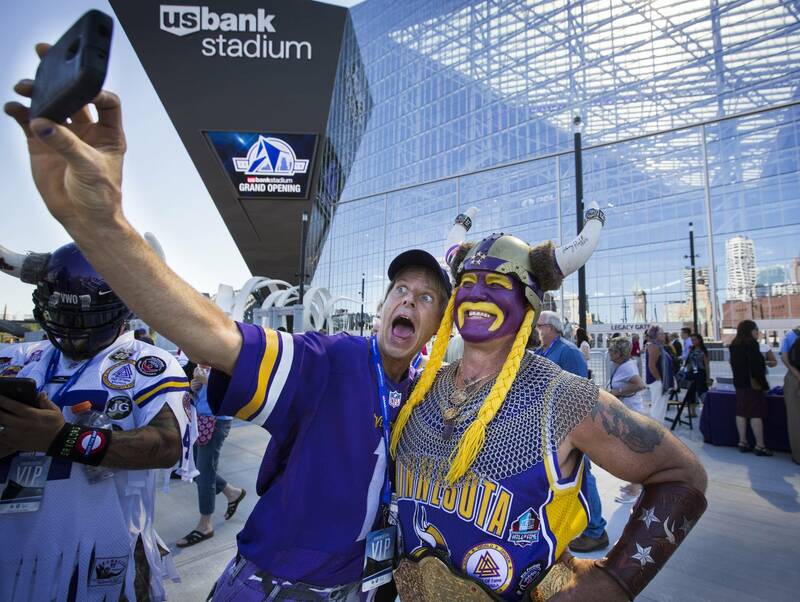 The Vikings will play their first game in the building, against the San Diego Chargers, on Aug. 28. The Vikings are also poised to start construction on a new $500 million corporate headquarters and mixed-use development in Eagan, moving the team's off-field operations from Eden Prairie. 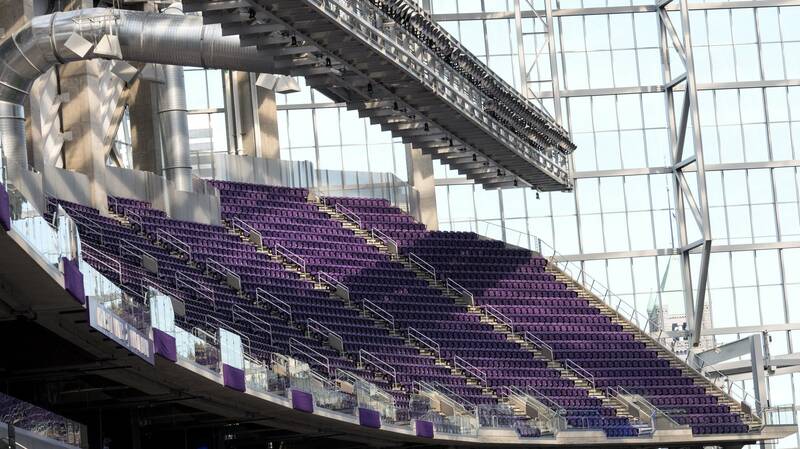 • At 1.7 million square feet, it has almost twice the floor space of the old Metrodome, although about the same number of seats — 66,000 expandable to 70,000 for events like the Super Bowl, which is coming in 2018. • There are 2,000 television sets, and 2 giant video boards, each bigger than a typical city house lot. • First events include an International Cup soccer game in 12 days, a Luke Bryan concert Aug. 19 and Metallica concert the next day. • The Vikings will take the field for the first time Aug. 28. They'll play the Packers Sept. 18, the second game of the regular season. • Like the Metrodome, there will be rollerblading nights in the concourses at the new stadium, including one Sept. 26.